Welcome the fall season into your home with this spectacular wool painting, “Autumn mood”. The red, yellow, and orange shades of the leaves high up in the trees and the bushes below will draw your eyes into this painting. In the center, a figure under umbrella is walking slowly along the meandering path of the park. The attention to detail in the painting will prompt a closer examination of the techniques I used to work with the wool fiber to capture the texture of the foliage in the misty fog. The colorful and bright wool painting “Autumn mood” will always remind you about the beautiful autumn season and will complement any room in your home. 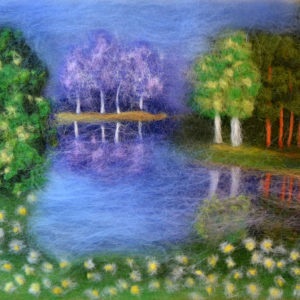 The wool painting “Autumn mood” is an original artwork. Painting size: 14 x 11 inches (35.6 x 27.9 cm). Painting is nicely framed in a mahogany/gold frame, and ready to hang. Overall size: 17 x 14 inches (43.2 x 35.6 cm).